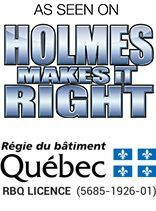 Water Damage Montreal is a reputable and local company in Montreal. We opened our doors in 2009 and have worked on several large projects, including projects in hotels, airplanes and commercial buildings. Water Damage Montreal is a leader in the restoration industry and has been awarded and recognized as Canada's Top Restoration Company in 2015. Mission: Our mission is to provide exceptional service while working hard to keep your home and business clean and safe. As Canada's top restoration company, we have live agents working 24/7 to deal with any water damage emergency or water damage disaster inquiries. With our extensive and intense trainning program, we ensure that all of our IICRC certified technicians and contractors are experts before working on any site or project. Reliability: We promise to be onsite within 45 minutes. We understand that emergencies can cause worry and frustration. We want to ensure that we take care of you and your family during a water damage crisis. After contacting Water Damage Montreal, a specialized team will be dispatched to the site, equipped with top-of-the-line equipment. We will keep you updated, every step of the way, with the services that need to be completed along with a breakdown of the costs. During the process, we focus on you and your family to ensure that you are updated with the water damage restoration project. Our 24/7 live agents will follow up and answer any questions that you may have. Integrity: At Water Damage Montreal, we provide free inspections on all visible water damages. Water Damage Montreal has developed long lasting and strong relationships with every insurance company in Canada that positively impact all of our customers lives. With our exceptional customer service, we can assist you with all communications that need to handled with your insurance company. Also, Water Damage Montreal provides 0% financing for 24 months to all eligible home owners and business owners. We value our customers and are delighted to provide various options for them to choose from.